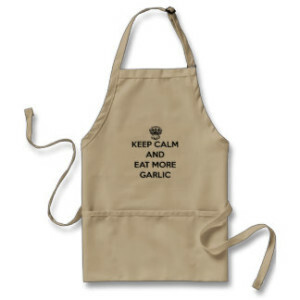 Knowing when to harvest your garlic will depend on many factors. Image courtesy of Cedarholm.com. You’ve planted your garlic, weeded it, and waited patiently as it grew tall. Which brings us to the big question: when to harvest garlic? Like many things garlic, there’s unfortunately not one universal answer as far as the best harvesting time or when to harvest garlic. The two biggest variables are the type of garlic and the climate, including whether or not you’ve had a particularly warm/cold/wet/dry season. That’s not a satisfying answer, so here’s the best general rule of thumb: consider harvesting your garlic when about half of the lower leaves of a plant have yellowed and started to die off. You’re aiming for a nice middle ground when harvesting, as you want the bulb underneath the ground to grow as big as possible but you also want to harvest when most of the wrappers are still intact, as that protects the head of garlic and allows it to stay fresher and store longer. If all the leaves are still green, it’s too early to harvest; if all the leaves are yellowish or brown, you’ve waited too long. 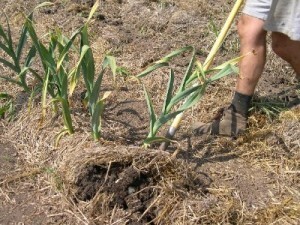 Picking when to harvest garlic is also a matter of its intended end use. If you’re growing to sell at farmers markets when visual appearance is importance, you might fall on the side of harvesting sooner in order to keep outer bulb wrappers intact and not stained or damaged. If you’re growing a small amount that you know you’ll eat quickly, you might wait longer to harvest, as the bulbs will be larger and the fact that wrappers may be damaged and storage life will be short isn’t an issue. Special care must be taken if you’re growing Asiatic or Turban cultivars, as they’re a bit unique since they mature very early in the season. Many growers recommend harvesting them as soon as any leaves on the plant begin to yellow and die back. 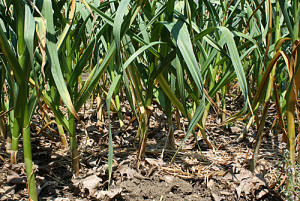 The same type of garlic won’t always be ready to harvest at the same time each year and plants in the same row may mature at different times. If you think it may be harvest time, test a bulb or two first by digging up a likely candidate. You’re hoping for nice, large bulbs that are firm with the outer wrappers moist and intact; smallish immature bulbs aren’t ready for harvest and bulbs that are dry or losig their wrappers have likely been left in the ground too long. The good news is that you have a lot of leeway as far as when to harvest garlic and a reasonably wide range of good harvesting times to aim for. 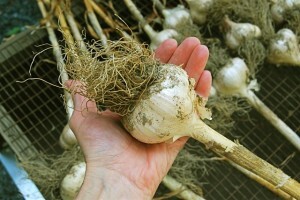 When harvesting your garlic, never pull it up by the stalk as it may damage the bulb and decrease storage time. Use a shovel or fork to dig into the ground by each plant, gently turning it up but giving yourself some margin for error to not hit the bulb. This takes some practice and hands-on experience but it’s by far the best way to harvest your garlic crop. You’ll quickly find a rhythm to it and can switch off with another worker to break up the monotony, as the harvested garlic will need to be cleaned and prepped for storage and drying as well. Considering you often have to wait 9 months or so to reap the fruits of your garlic labor, rushing at the very end and damaging bulbs is definitely not the way to go. Large commercial growers will often use cultivators that undercut crops to speed up harvesting but this produces far too much wastage for most small growers of gourmet garlics. Despite your best efforts of timing when to harvest garlic you’ll inevitably have some bulb casualties that get damaged but don’t despair: it’s just another reason to eat more garlic as you can earmark them for quick use in the kitchen!